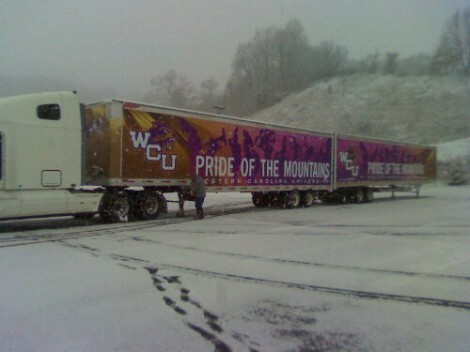 A truck pulls out in the snow on Dec. 25. 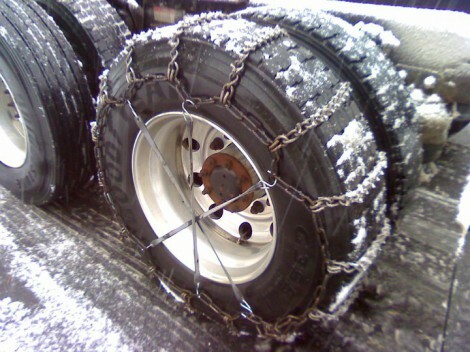 Chains are put on the trucks that will carry the band's equipment to California. Drivers secure the trucks in the snow. 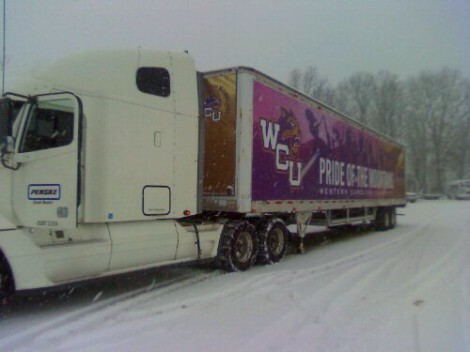 In advance of a planned 4 a.m. departure on Sunday, Dec. 26, two truck drivers spent Christmas morning putting chains on the wheels of the three trucks taking the WCU Pride of the Mountains Marching Band’s equipment to California for the Rose Parade. Jimmy Crocker and Stacy Wyatt coordinated with a salt truck and snow plow in order to move the trucks 2 miles closer to the highway – a project that took four hours to complete. “We couldn’t even get to the trucks when we first got there,” said Crocker. With wintry weather making travel more challenging, the drivers are considering an alternative route that is south of Interstate 40 once they get to Little Rock, Ark. “One of the drivers said there was a bad storm somewhere over Oklahoma. The southern route will take us along the border of Mexico and through the lower part of Phoenix,” said Crocker. Using the trucks to transport instruments, equipment, uniforms and luggage is saving the band $40,000 in checked baggage fees. Many thanks to Jimmy Crocker, Marion Ferguson, Carol Ferguson, Stacy Wyatt, Martin Clark and Jeremy Parker for volunteering their time to drive the Pride of the Mountains Marching Band’s equipment to Pasadena for the Tournament of Roses! Crocker is the only driver with a child in the band. (His daughter Haley M. Crocker plays cymbals.) That’s not his only tie, however. His father, the late Jim Crocker, was WCU marching band director Bob Buckner’s band director when Buckner was in high school in Waynesville. Watch their progress across country here at roseparade.wcu.edu.